Remember these placemats? I quilted and bound them and sent them to Mom and Dad for their anniversary. Hopefully the obviously scrappy-ness of them will make her less afraid to use them. The slogan could be "Slop all you want; I'll make you more." Bad News: I couldn't find my car keys. This is unusual for me. My keys go on my key hook. They always have, but apparently they did not this time. I looked and looked and looked. I knew they were here because I drove here and the car was still in the garage. I thought back to the last time I had my keys in my hand. Hmmm, I went back to my car to get a CD out of the player and the car has to be on to do that, so... Oh, yeah! When I took out the CD, I also took out my old broken GPS so I could throw it away. I threw it away in my husband's office after I asked him if there was any use in saving it. Did I throw my keys away? Oh no! What if my husband already emptied the trash? Bad News: My finger is still bleeding and should be tended. Let me check and see what first aid supplies I have on hand. 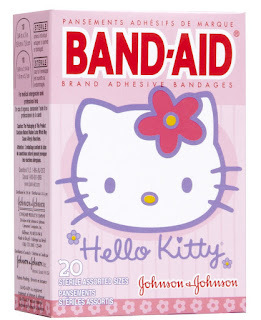 Good News: I have Hello Kitty Band-Aids! I love a story with a happy ending, don't you? I know a lot more about turkeys than I did this morning. Once in my hotel room, I pulled out some Block of the Month quilt blocks from the Quilt Basket. I am still two months behind, but I like progress. And so ends my week of hotel sewing. I really enjoyed it, especially since I don't know when I'll touch my sewing machine again. Tonight's hotel room sewing produced two tablerunners. I think I will give them to my mother and mother-in-law for Mother's Day next year. Do I sound overly prepared and organized and ahead of the game? Allow me to shatter that perception: Today I discovered that Sunday is Father's Day. Oops! I thought it was next week. I got the fabric and pattern from the Quilt Basket. I think I just figured out what Mom is getting for her birthday -- tablerunner #29! or is it #30? I can post this since Mom doesn't ever look at a computer. If you see her, keep my secret, OK? Earlier this evening, I dined at a local Italian restaurant with some students from my quilt class. The calzone was quite nice. I asked them to box up a piece of chocolate cake for me to eat in my hotel room tonight because, as you might know, I am somewhat partial to chocolate cake. Sadly, the cake was disappointing. OK, it was a little beyond disappointing: it was gross. I was sad. I decided to dive into my quilt project stack here in my hotel room and pull out something that would make me happy again. How cute is this? The light is not great in my hotel room, so the bright orange polka dot border looks reddish in the photo. I bought this kit from my good friend at Sturbridge Quilting and Sewing when I taught there last week. Another quilt to add to my to-be-quilted pile. Quilt Top #2 -- DONE! Remember this quilt? It is huge (102-inches square). I finished piecing it tonight in my hotel room. What project shall I work on next? 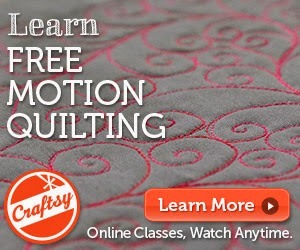 Fortunately, I am teaching at a quilt store this week. I think maybe they can help. I am looking forward to teaching five days of classes! I just spent a fantastic two days teaching in Massachusetts and got home after 10 pm Saturday. Monday morning, early, I will leave to teach for five days in Virginia. The 32 hours I have at home are busy ones. I got some sleep, unpacked my suitcase, did some laundry, repacked my suitcase, unpacked my quilting samples/supplies, and repacked my quilting samples/supplies. I also spent some time in the kitchen. I cleaned out the crisper drawer and made veggie stir-fry for Jeff's lunch. I made enough for him to eat it again later this week. I made ham and spinach couscous for Jeff to eat later this week. Erin hates spinach like I hate snakes. I made some spicy fried tofu for Erin to eat later this week. It is Erin's favorite, so Jeff probably will not get to each much of this. I made congee for my lunch today. I made enough for Jeff and Erin to have some later this week. I cooked up an eggplant and made a tray of eggplant parmesan. I left Jeff and Erin baking instructions for later this week. I made some quinoa and veggie pilaf and stuffed some peppers for Jeff to cook up later this week. I made pizza for Jeff (pepperoni) and me (olive) for tonight's dinner with leftovers for snacking. I made cheese pizza for Erin's dinner tonight with leftovers for snacking. Hopefully they will have enough food to survive while I am gone. The snake had the last two eggs for an early breakfast yesterday before Jeff was awake and embracing his "keeper of the eggs" responsibilities. Jeff is on nest watch while I am working out of town. I doubt there will be any eggs left by the time I get home. After the excitement of watching the robins fledge, I thought my nest watching was done for the season. Yesterday morning, I noticed new eggs in the old nest! This is either a copperhead or a milk snake. I don't know and I don't care! I am terrified of snakes, but these are my babies! I leaned out the window with a broomstick and carefully wrestled that nasty thing out of the nest, making sure not to ruin the nest or damage the other egg. I donned boots and gloves and armed myself with a shovel and went out to retrieve the other egg. The snake charged me, but I defended myself with the shovel. The snake slithered away from me and I picked up the egg. It had no visible damage so I put it back in the nest. I am worried about the fallen egg. I am worried that the snake will come back. But for now, Momma is back in her nest. 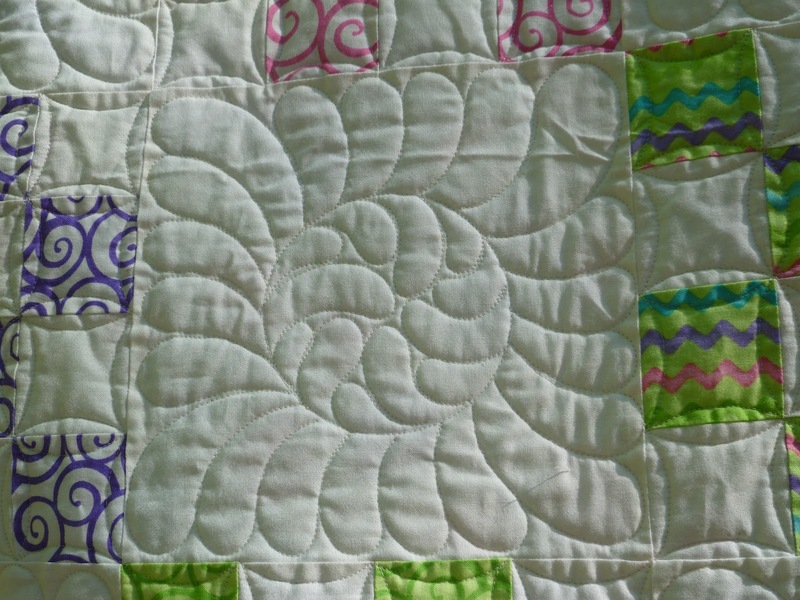 The words were quilted with two threads through the needle at once: 30-weight rayon and 50-weight cotton. 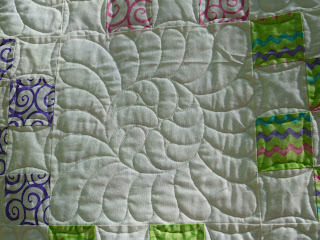 The circle was stitched with an 8-weight thread in the bobbin (I quilted it upside down). The background threads were both 100-weight polyesters. I, of course, used my sweet Sweet Sixteen! The particular challenges I was dealing with have been resolved (I hope!) and I have sent this quilt on its way to someone who needs it more than I do. Long, long ago in a state not so far away, a lovely young couple got married. As usual, I planned to make a quilt and, as usual, I didn't finish it in time for the wedding. Or later that month. Or later that year. The fabric is S'mores from Moda. I made a quilt for myself from this fabric several years ago and Alexis tried to steal it from me. I scrounged around the internet to find fabric to make her wedding quilt, and this was even before she was engaged. The happy couple is still happy and they are now happy with their quilt. All this to say "Happy Birthday!" to my dear husband.